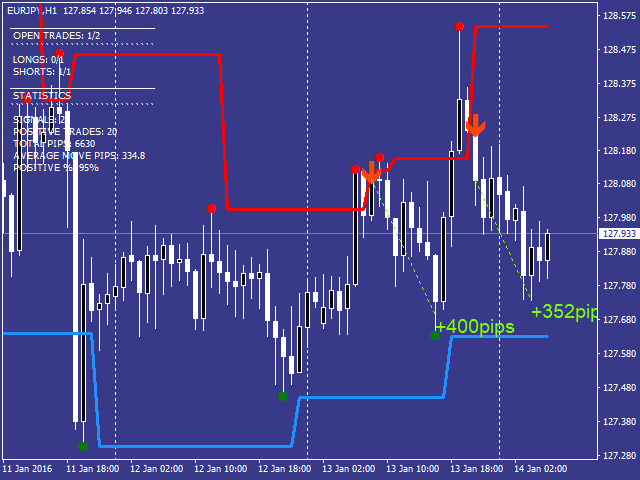 The ABCD Pattern indicator analyzes the ABCD patterns to detect price movements. 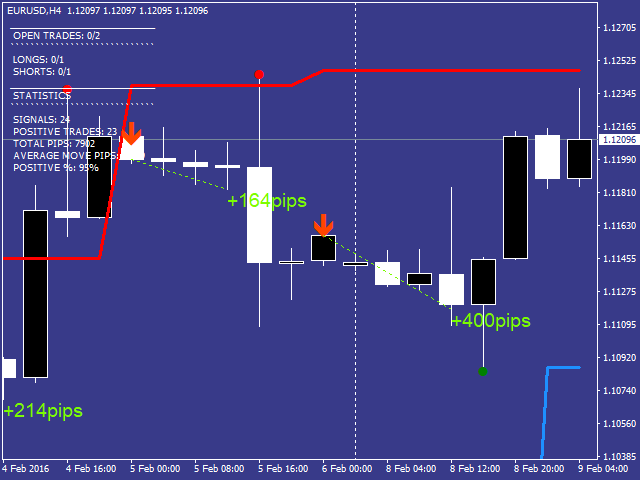 The indicator displays the trade statistics and clear entry signals using green (buy) and red (sell) arrows. It is possible to enable terminal alerts, email messages and push notifications. Instantly available statistics of up to 1000 signals. Very easy to use, no complicated input parameters. Terminal alerts, email messages and push notifications. 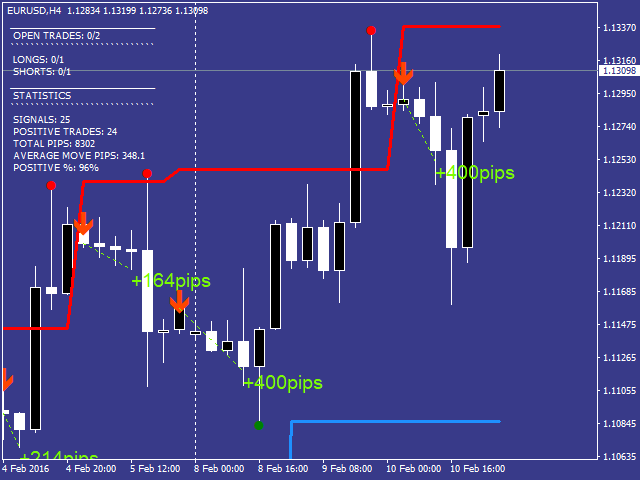 Exit from a sell trade #1: fixed stop loss and take profit levels. 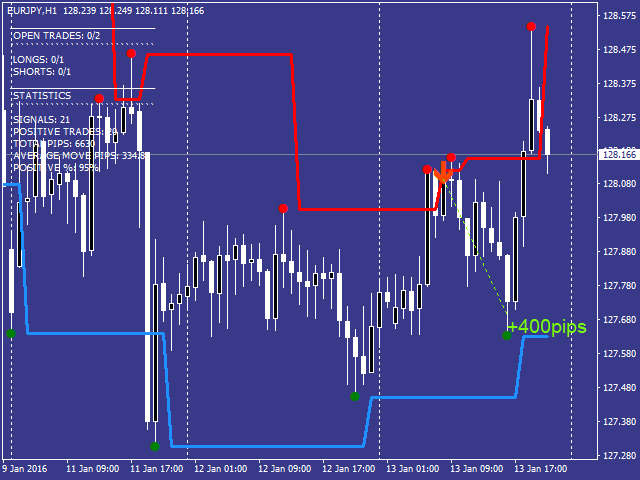 Exit from a sell trade #1: near the blue line. 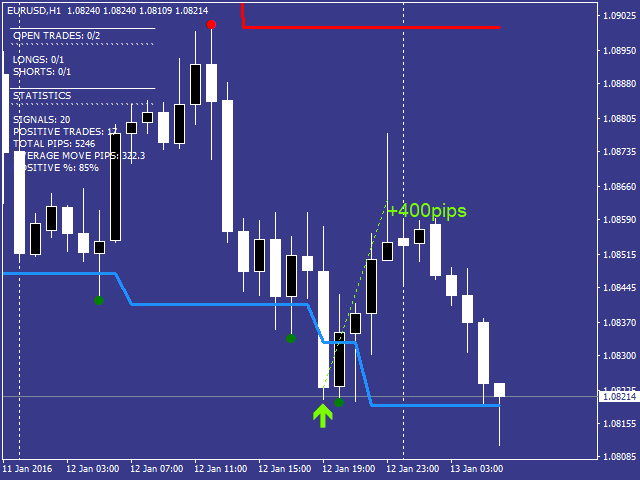 Exit from a buy trade #1: fixed stop loss and take profit levels. Exit from a buy trade #1: near the red line. OPEN TRADES: the number of active signals. LONGS: the number of active buy signals. SHORTS: the number of active sell signals. SIGNALS: the number of past signals. POSITIVE SIGNALS: the number of profitable past signals. TOTAL PIPS: the number of pips from all past signals. AVERAGE MOVE PIPS: the average number of pips earned from profitable past signals (the value can be used as a profit target). POSITIVE %: percentage of profitable signals. Candles from history to get stats - the number of candles in history for statistics, it can be increased to obtain instantaneous statistics of up to 1000 signals (15,000-20,000 candles will be required) for a given pair. 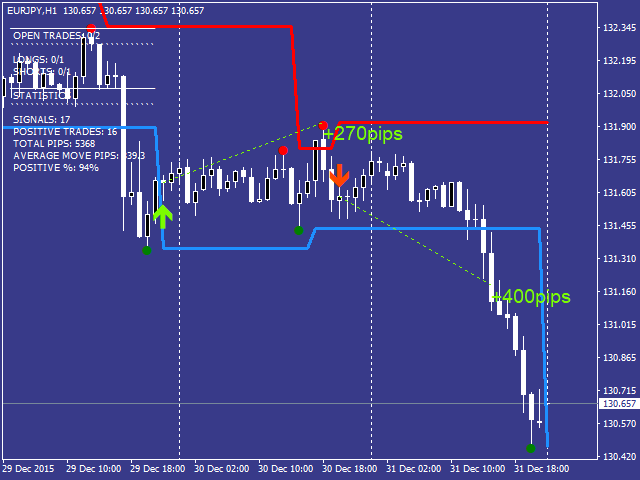 Virtual Fixed SL - fixed stop loss for the statistical analysis. 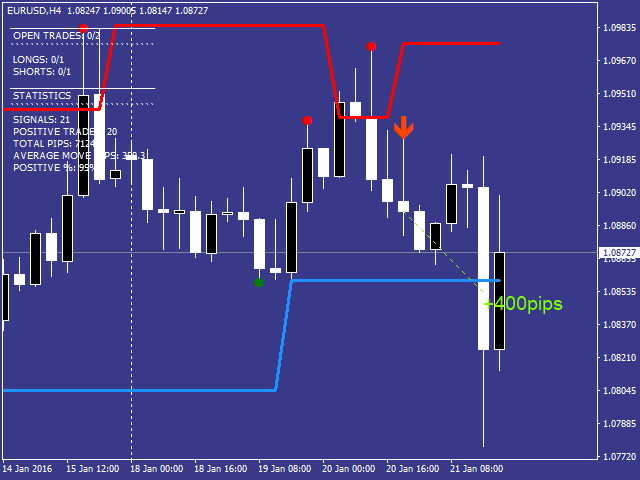 First Virtual TP Target - fixed take profit for the statistical analysis. 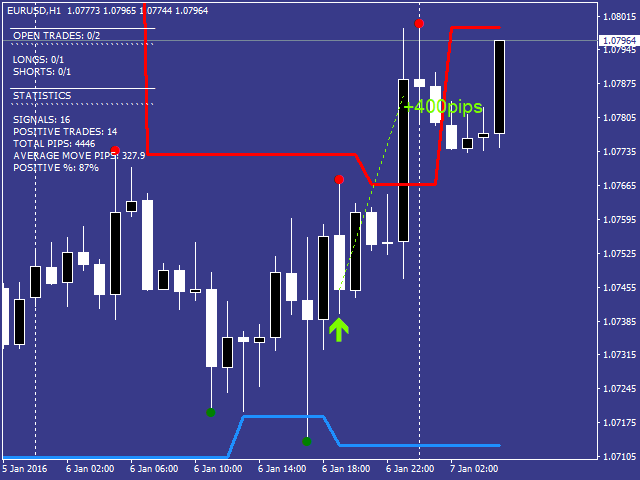 Second Virtual TP Target - fixed take profit for the statistical analysis. Maximum Active Signals Per Instrument - the maximum number of active signals on the symbol. When this value is reached, the indicator stops showing new signals until the previous signals are closed by virtual fixed take profit or virtual fixed stop loss. Maximum Active Buy Signals Per Instrument - the maximum number of active buy signals. When this value is reached, the indicator stops showing new signals until the previous signals are closed by virtual fixed take profit or virtual fixed stop loss. Maximum Active Sell Signals Per Instrument - the maximum number of active sell signals. When this value is reached, the indicator stops showing new signals until the previous signals are closed by virtual fixed take profit or virtual fixed stop loss. Enable Alerts - enable alerts. Enable Email Notification - enable email messages. Enable Push Notification - enable push notifications. Buy Signal Color - color of the trend line and arrows for the buy signals. 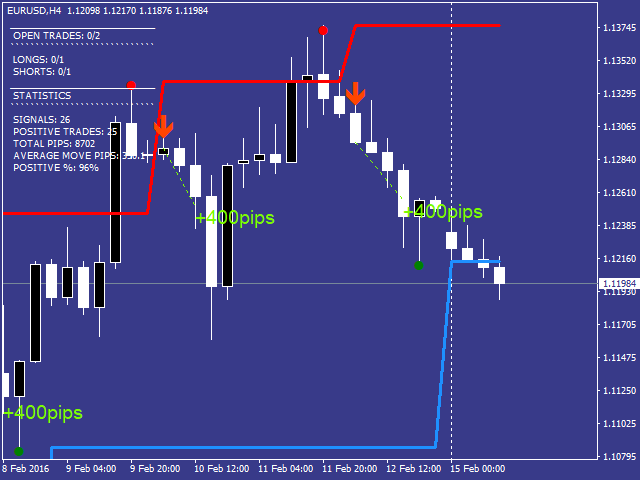 Sell Signal Color - color of the trend line and arrows for the sell signals.